Well, it’s not because you have a Rose Tinted view of them, but because socks have indeed changed. The old style warm, longer lasting socks were not only made in Britain, but they were also made using wool. Wool is a wonder fabric. It keeps you warm in winter, and cool in Summer. This is because as a natural product it holds air pockets to insulate, and wicks away sweat to keep you cool. Well, socks today are made using cotton. Cotton wicks away sweat, but does not insulate as well as wool and the cheaper the sock, the lower the quality of cotton. This means that the staple length is shorter which means that the cotton wears out quicker. Well, we all know how long a sheep’s coat is, and so how long a length of wool is so it is not surprising that a wool sock will last so much longer. Fortunately it is still possible to find wool sock. You do pay more for them, but they last so much longer. 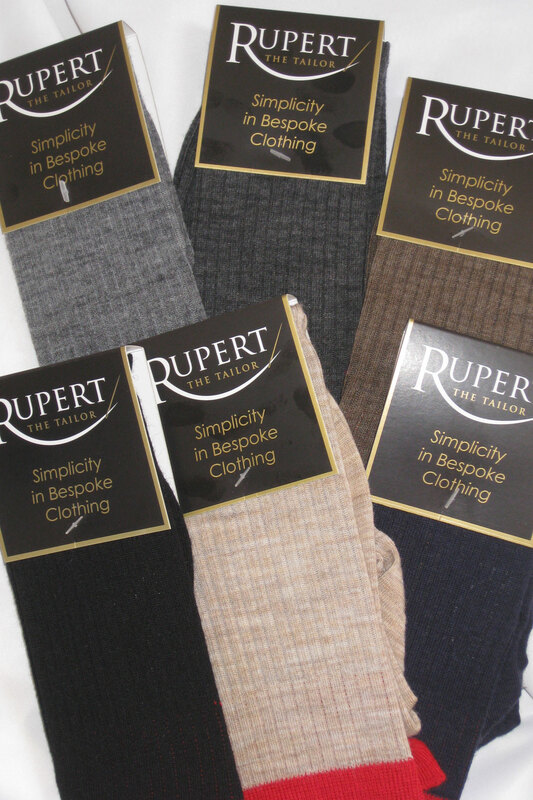 We have developed a short sock and a knee length sock at Rupert The Tailor. The Rupert The Tailor Red Top Sock and the Rupert The Tailor Shortie Sock, these are made from wool nylon, in a huge range of sizes (After all, it’s no good having a sock that’s too big or too small, that’s just uncomfortable). It’s not just a plain sock either, as we have added reinforcement in the heel and the toe and made the toe seam the best available. For many years, a linked toe has been considered the best to have. It is almost invisible, and requires someone to literally pick up each loop in a sock toe on a needle. That’s usually 168 on every sock. As you can imagine, the chance of missing one is very high, and the cost of doing it, well, that’s high too. So we use a lock stitch. It’s the more practical method and ensures greater strength. The disadvantage is that you can end up with a large seam right on the top of your toes. Our socks dont. We have improved the seam so that it is just as strong, but much flatter. The best of both worlds. So treat yourselves or a loved one to a proper sock this Christmas. After all, it’s going to be a cold one! Don’t hesitate to contact us with any questions by phone on 01335 361287, by email here or by using the online chat on the website. Next PostNext Rupert The Tailor’s Purple Suit Hits The Stage with the Funny Fokkers!